A new series of military-grade MIL-DTL-17 RF cables is ideal for military electronics, electronic countermeasures (ECM), avionics, unmanned systems, IFF systems, GPS, and Satcom. 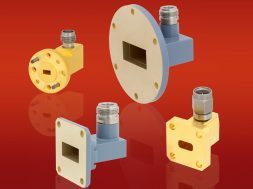 They feature operating frequencies of up to 12.4 GHz and VSWR as low as 1.3:1 per connector. This new product line is made up of six different cable types in 124 basic configurations for a total of more than 1,200 part numbers that are all available for same-day shipment with test reports. They are constructed of MIL-C-17 qualified cable, MIL-PRF-39012 qualified connectors, J-STD soldering, and AS23053 heat shrink. These commercial-off-the-shelf (COTS) cable assemblies are 100% tested and come complete with test data, test report, and material lot traceability.